The Kiwi has overseen the previous two Lions tours and hasn’t ruled himself out of leading the team to South Africa. Gatland hasn't ruled himself out of the running. WARREN GATLAND HAS revealed he has held ‘a couple of informal conversations’ over coaching the Lions in South Africa in 2021, having overseen the last two tours to Australia and New Zealand. The Kiwi, who will step down as Wales head coach after this year’s World Cup, admitted last night that a third tour in charge is ‘definitely a possibility’. Gatland said he will look to take a break from the game following the World Cup in Japan, but hasn’t ruled out the idea of following in Ian McGeechan’s footsteps by taking charge of three successive tours. Speaking at a Welsh Rugby Union event in Cardiff, the 55-year-old said: “I’ve had a couple of informal conversations and that’s all it’s been at the moment. Gatland guided the Lions to a 1-1 series draw with the All Blacks in 2017, while masterminding a 2-1 win over Australia Down Under in 2013. Joe Schmidt, who will vacate his role as Ireland head coach after the World Cup in September, has also been linked with the Lions job for 2021. Email “Gatland holds 'a couple of informal conversations' over coaching Lions in 2021”. 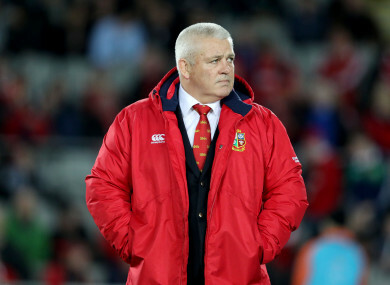 Feedback on “Gatland holds 'a couple of informal conversations' over coaching Lions in 2021”.